Is It Good? All-New Doop #1 Review – AiPT! Doop is a character thats been used more for comedic relief than anything, but has always held a soft spot in most people’s hearts, and that’s because he’s so damn innocent. The guy’s powers are all over the place, including superhuman strength and durability, flight, regeneration, physical malleability, ability to replicate objects and a vaguely defined ability to manipulate time and/or space. Until now. In his own series Marvel spends most of its time showing off his space/time travelling powers…is it good? This issue opens with Doop in his Doopspace doing some research. 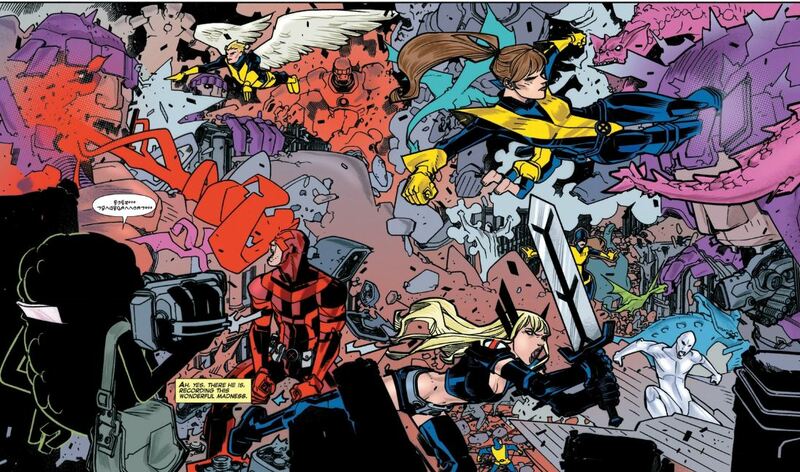 He’s quickly called into action and he jettisons himself off to a moment during the All-New X-Men run from a year ago. It turns out he’s filming the whole thing and even helps direct the course of history at the same time. This issue follows Doop through the last year of X-Men comics and suggests he was there all along. We just couldn’t see him. Underlying all this is a love story as Doop has fallen head over heals for a very special X-Man. Love the Doop-centric movie posters. Peter Milligan writes a so-so script here with a heavy dose of recapping last year’s X-Men events. He seems to be having fun adding dialogue and a new layer to the preceding events, but if you’ve read them you’ll find yourself a bit bored. Not a lot of events take place in this issue and Doop’s ingratiation doesn’t add much beyond subtle actions. The premise of this issue doesn’t hit until the final page, which is a good one, but all that precedes it feels like filler. That’s because Doop is an observer like us, rather than taking part in much of the events within. It did cross my mind how silly it was Cyclops could fly that jet. Now we know how. David Lafuente draws this issue and he does in with a very fun style. Panels flow quite nicely and his Doop, while a lot less weird looking than he’s been shown previously, has a cartoony and Muppet-like quality. He lends a smile to your face and always seems to be sparked with a bit of life. Lafuente’s Kitty is also super hot, and the remaining X-Men have a realistic look and feel that offsets the cartoony nature of Doop. What’s a Doop comic without some gross stuff? This is a pretty good issue that’s a teensy bit setup and a hell of a lot of recap. The concept of Doop roaming through moments we’ve read before is interesting in idea, but when executed it’s a bit of a snore.